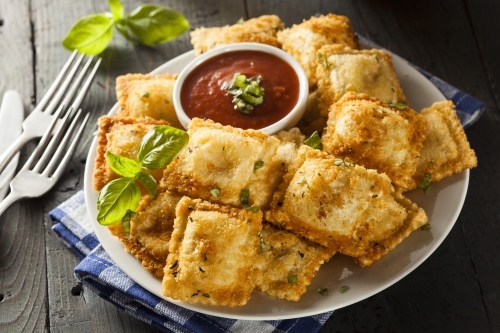 Fried Raviolis make for an excellent appetizer. They’re soft and chewy in the middle, a little crisp on the outside and filled with your favorite ingredients. If you make your own raviolis you can fill it with anything from mushrooms to crab meat. I personally won’t make homemade raviolis for this dish because you’ll find the frozen variety will taste just as good and you can still find them stuffed with different fillings like asparagus, cheeses and meats. Fresh gourmet type raviolis are best made with a wonderful sauce and served as a main course. I sometimes serve Fried Raviolis with a marinara sauce, but the other day I grated parmesan cheese on top and drizzled the ravioli with a combination of butter, onion, garlic and chopped rosemary and they were delicious. My best advice is to serve both. The kids will love them. Dip the ravioli in the egg mixture then the breadcrumb and set aside. Repeat until all the raviolis are breaded. In a small frying pan saute the garlic, onions and rosemary in the butter and olive oil until tender, about 2 minutes. In a large frying pan heat the 3/4 cup of oil and fry the raviolis in batches for 6 minutes turning once until raviolis a lightly toasted. Sprinkle with grated or shaved Parmesan cheese and serve with the garlic rosemary or a marinara sauce.